Recently Marc Gunther, one of my favorite bloggers, wrote a post titled “The Point After: Why I’m Done with the NFL” in which he details why he can no longer watch or support football. To him, it’s simply too inherently violent. His biggest concern is the risk associated with concussions…and it’s not just the NFL he’s worried about but college, high school and Pop Warner too when young kids, their brains still in development, can suffer permanent brain damage due to traumatic head injuries and high-speed impacts. I’m not intending to make a value judgment about football here. I still watch the NFL and root hard for my 49ers. But, I see and acknowledge Gunther’s point. Fortunately, some yardage gains are being made. After years of doing apparently little, the NFL has now (publicly) realized this is a problem – at least in terms of public relations – if not in terms of potential liability from the players’ association. Last month the NFL announced it was donating $30 million to the National Institutes of Health for research, potentially including research related to concussions. They’re running commercials during the game (featuring Tom Brady) to promote their investment in this. Injuries due to concussive force also impact the military – big time. Instead of hits from linebackers, there’s brain injuries related to bombs and other devices that explode in the vicinity of our troops that lead to concussions. And, like the tough NFL players, our proud and determined soldiers don’t want to be pulled off the field. Fortunately, the military is taking this very seriously. They’re investing in helmet-based RFID sensors and now, according to Stars and Stripes, the Army is working with the NFL to test sensors in football helmets, and any information gathered will be shared with doctors, engineers and the military. The goal is to prevent concussions — or at least minimize the severity — and reduce the stigma of seeking treatment for head injuries.The Army has been putting blast sensors in helmets since 2007, and will use 45,000 of them to monitor head injuries suffered by bomb blasts in Afghanistan. 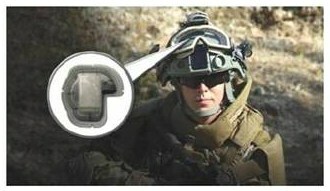 BAE Systems, provider of the helmets, reported on July 9, 2012 that the Army is continuing to order the helmet sensors. Hopefully, for the sake of all of the soldiers as well as the men and boys that play football, forward progress can be made. This entry was posted in RFID News and tagged concussions, football, military, nfl, RFID, sensors. Bookmark the permalink.